4 wheelers in India: Modified Version of Honda Brio Introduced! Modified Version of Honda Brio Introduced! Modified Version of Honda Brio Introduced! 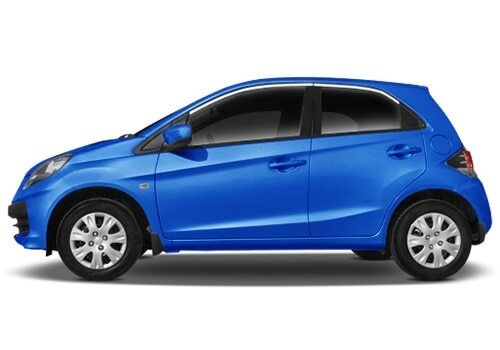 As expected, a modified version of the Honda Brio has been launched in the Indian markets. The Company has upgraded the features of all Brio variants--EMT, EXMT, SMT, VMT, VXMT and VXAT. Now, the all new Honda Brio prices start at just Rs. 4.12 lakh (ex-showroom price, New Delhi). The Company has tfeatures aken valuable feedback from its customers of Brio and upgraded its to make it more desirable. No doubt, the all-new Honda Brio is a perfect hatch car, loaded with wonderful features. It embodies some high quality features along with advanced technology, which indeed provide buyers with an effortless driving experience. It is also known for its exceptional mileage and great performance that made it one of the most exciting models in the hatchback segment. Now, it has got even more exciting with a new set of features.As per customers’ requirements, the Honda Brio has been updated with an adjusted driver seat height and a rear windshield defogger. These are the two new features added to the Brio. This will certainly enhance the comfort and convenience of the driver and will also offer passengers a much better driving experience. As far as the appearance of the car and its exteriors are concerned, the Brio is virtually untouched. In fact, it now comes with the same exterior design and looks like the existing model. As you can see in the pictures of this model, this vehicle has the same front grille, headlight cluster, body colored bumper and so on of the earlier model. The technicalities of the car also remained unchanged.This car comes with a 1.2 litre i-VTED petrol engine with a displacement capacity of about 1198 cc that churns out power of about 86.2 Bhp at 6000 Rpm and makes a torque of 109 Nm at 4500 Rpm. Customers can choose this vehicle in both manual and automatic transmission gearbox options. The all new Brio is known for its fuel efficiency as it produces a superior mileage of about 18.4 kmpl. The Company is making some aggressive moves in the markets by launching fresh new models. Recently, it introduced the most awaited compact sedan Honda Amaze, and now it is coming up with the improved version of Brio.The new Honda Brio features like driver seat height adjustment and rear defogger will certainly make the car more exciting. It is perhaps the right time to spend your money on the new Brio as it is more exciting, affordable and a good looking hatch.